DC’s Young Animals imprint is giving us some of the weirdest, most enjoyable books around lately—Doom Patrol, Cave Carson, Shade the Changing Girl, the list goes on. The latest book heading to Gerard Way’s imprint is equally weird, but it’s a pull back far into the wonderful mind of the legendary Jack Kirby. Forager the Bug returns! 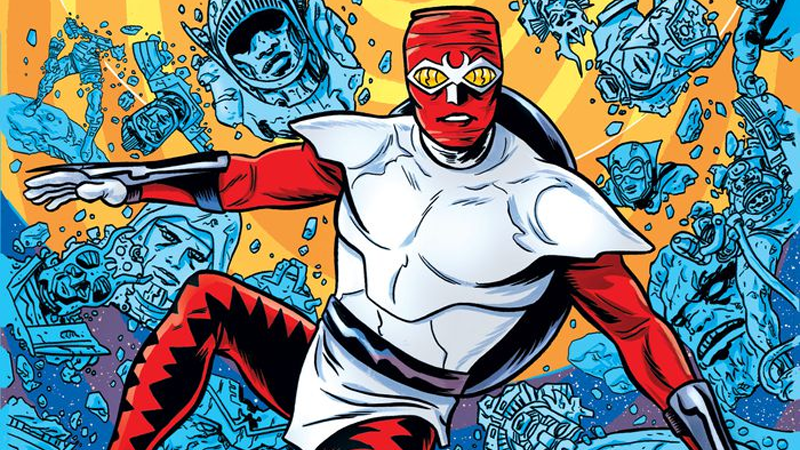 Yes, Forager—first created by Kirby in 1972 as a humanoid bug from a “micro-life” civilization that lived in on New Genesis, home to Kirby’s pantheon of New Gods—is the star of Young Animal’s first miniseries, by Lee Allred, his brother Michael Allred, and Michael’s wife Laura Allred. First revealed by the A.V. Club today, Bug! : The Adventures Of Forager will run as a part of DC’s ongoing celebration of Kirby’s career this year to mark what would’ve been the comics icon’s 100th birthday. The series itself will see Forager on a cross-dimensional journey through the multiverse, and as the cover implies, there could be more than a few appearances from other Kirby legends—Sandman, Blue Beetle, and Atlas are just a few of the already-confirmed appearances across the miniseries. Young Animal has quickly become a home for DC to try out some really quirky, fun, and inventive comics, so it’s great to see it being a part of the publisher’s wider celebration of Kirby this year. Hopefully Forager will end up just as fun and weird as the rest of the imprint’s output has been so far.